Double check your coverage. Make a quick call to your insurance agent to discuss your coverage and to make sure that you understand it. If storm damage requires storm restoration to your basement, roof, or other structures on your property, do you have the proper coverage to ensure everything can be brought back to normal? Knowing that you’re covered in the case of an unexpected weather event and storm damage can give you tremendous peace of mind. Remember…an ounce of prevention. Maintain the structure and exterior of your home, and keep trees regularly trimmed. If you have loose shingles or outbuildings that are already compromised and in danger of coming down, a strong storm can finish the job. The same is true for trees with dead limbs, or limbs that extend near your house, especially by windows. Storm damage is more likely to occur in these situations. Have a disaster plan in place that the whole family knows. In the event of a tornado or other storm warning, everyone in your family should know where the safest place in the house is and when they should go there. You should also have a designated meeting place if cell phone service is interrupted. A tornado may cause physical storm damage to your property, but as long as everyone in your family is safe, that’s the only thing that truly matters. Most everything else can be replaced, but it can still be quite stressful, so choose a restoration company with good reviews that can help smooth your path to recover. In the aftermath of a storm, stay out of harm’s way. Teach your children to avoid downed power lines and flooded basements. It’s tempting to want to investigate the storm damage, but the possibility of danger from electrical shock both inside and outside is real. If you see downed power lines you should notify the power company immediately, but other than that, your first call should be a disaster restoration company. They can immediately to assess the damage and mitigate any urgent damage, such as stopping the flow of water into your house or boarding up any damaged structures. (Your restoration company will document everything for the insurance adjuster).They’re also trained in safety practices and will make sure your property is safe and secure for you. Have a storm preparedness kit. Keep a kit in your basement, or other safe place that contains batteries, bottled water, protein bars, a first aid kit, battery-powered radio and flashlights. You should also keep a small supply of current medications in your kit. Rotate out the perishable supplies as needed. Regularly monitoring your supplies will keep safety top of mind for you. 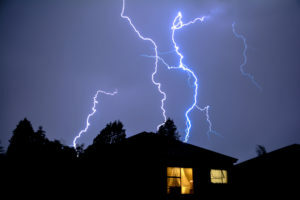 Spring storms are pretty much unavoidable, but it’s possible to mitigate both the emotional and physical storm damage that come along with them. Being as prepared as possible in advance can go a long way toward keeping your family safe and minimizing the amount of storm restoration needed. Should you need help with disaster restoration in the aftermath of a storm, the team of certified and trained disaster restoration experts at Hays + Sons are just a phone call away, 24 hours a day, 7 days a week, 365 days a year. With 140 employees, 120 vehicles, and eight separate locations, Hays + Sons has you covered.